SkyBell is a video doorbell that lets you see, hear, and talk to visitors from anywhere. It works with your Wi-Fi network and the SkyBell app to bring your front door to your phone. When someone rings the bell, SkyBell sends an alert so you can see and chat with your visitor—whether or not you're home. If you have a visitor who doesn’t ring the bell, SkyBell’s motion sensor kicks in and will tell you someone is there. Plus, its infrared camera lets you see them, even if it’s dark. SkyBell is made in California and works with one or more phones, so you can set it up to alert multiple family members. It’s easy to install, too, replacing your current doorbell but keeping the same chime. Simply figure out whether you have an analog or digital doorbell, and choose the right kit. In a few minutes, your door will be transformed to an all-seeing place that you can check in on, any time you want. Hello everyone! I'm proud to introduce SkyBell to The Grommet. I'd be happy to answer any questions you have! The idea for SkyBell started when some founders were discussing how we wished there was a Wi-Fi doorbell so we could see who is at our door while we're away and to better handle package deliveries. Then it quickly evolved into addressing safety needs around answering the door. It's funny that the doorbell hasn't changed in a century and, as a homeowner, you never really feel comfortable about not knowing who is at your door. We wanted to change that. SkyBell is a WI-Fi enabled video doorbell that lets you see, hear and speak to the person at your door. When a visitor presses the button or triggers the motion sensor, you receive a live video feed on your smartphone. You can also activate the live video feed at any time from the app. SkyBell is a big first step in smart home security. By having a SkyBell, you can feel confident knowing you can always see who's at your door. SkyBell is connected to the internet, and is therefore one of the latest home automation and Internet of Things products. @Andrew I recently heard about the "Ring" on the Comedy Channel of Sirius. They were offering it for 185.00 with the keyword in the shopping cart. How is yours better than theirs? Does it have to connect to my Wifi network to work? How would it add to the security system I already have? @Lynne - Great question. SkyBell has a big advantage: On-Demand Live Video. With a SkyBell you can activate the video feed directly from the app. This means you can check in when you're away from home any time you want. We are also Made in the USA. Both products must connect to your WiFi to work. It may not integrate directly into your current security system, yet it will augment your security because it shows you who's at the front door. @Lynne - Also, SkyBell is very focused on innovation. We have another exclusive feature that users love: Silent Mode. This allows you to turn off the indoor chime from making a sound in your home. Mothers especially love this feature! It's also worth noting that SkyBell is part of Apple's HomeKit platform and was selected by Comcast for the Xfinity Home platform. We are very proud of these accomplishments. @Andrew You said that you can see when you are not at home. Does that mean you can be on any Wi-fi network? Hi Sandra, you just need the Skybell to hook up to a Wi-Fi network. Your phone can be on Wi-Fi but doesn't have to be to see what is going on. How is this product distinctive and different? SkyBell is quite distinctive due to its design and innovation. In fact, we were nominated for the prestigious CES Innovations Award for Engineering and Design in 2013. The first thing you notice is the small form factor and beautifully minimal design. SkyBell also includes some exclusive features like On-Demand Live Video capability, silent mode (turns off indoor chime sound via app) and the ability to work with a digital doorbell chime. And for anyone looking for an easy to follow installation guide, here you go! Does the video also get recorded, in case you're not at your cell phone at the time? Also, does the camera adjust to see a package/envelope that might have been left at the door? How far does the motion sensor reach? @Michael - Yes, each video session that is answered is recorded to our cloud server. 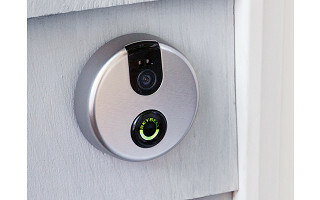 Soon, you'll have the ability to see recorded video when you do not answer the doorbell video.The viewing angle is fixed, yet it is a wide-angled lens. The motion sensor works about 5 feet in front of the device. @Andrew Perfect. I have some ding-dong ditchers to catch in the act...kids that do it late after football games mainly. How would we access the feeds? You can access them right from your phone, Denise! Show those pubescent pranksters who runs the neighborhood! Will you support wireless doorbell systems? @Todd If you have a wi-fi enabled wireless doorbell, it can potentially work in the future. If it's a proprietary wireless doorbell, it likely won't work with SkyBell. You'll need a digital or mechanical door chime. What if I don't have a doorbell connected to chimes? @Gary If you don't have a doorbell connected to a chime, you'll need to install power wires, a transformer and a door chime. SkyBell works best when connected to all three. What operating temp. will this work at? especially the cold end for Canada. @Doug SkyBell will operate from -40 to 140 degrees Fahrenheit. It is 100% waterproof as well. We have tons of happy customers in Canada! Hello, I have a condo where other residents and guest will be walking past my door. How sensitive is SkyBell? Will is be ringing every time someone walks by? Also, I do not have a door bell presently. Would I need to purchase additional parts? @Rose - SkyBell's motion sensor is effective up to about 5-6 feet. In most cases, it does a good job preventing false alerts from a walkway or pedestrians. Also, the motion sensor can be turned off so that you do not get unwanted motion sensor alerts. For your doorbell, you'd need to purchase a mechanical door chime. They are very inexpensive and easy to install. Call this doorbell be "hack"? Can some else pick up mine signal via other "Wi-Fi" and get in? @Zima - We are very serious about the security of the Wi-Fi signal. SkyBell is as safe as any other mobile device that is currently on your network. I currently have a camera device hooked up to my doorbell. My problem id that the doorbell is 4 feet right of the door so when a person rings the bell and stands in front of the door, I get a very poor picture. How is the side vision on your device? @Michael - We have about a 130 degree field of view. We also have an angled wall mount that is sold as an accessory. This accessory allows you to angle the SkyBell another 20 degrees. In almost every case, the visitor will move directly in front of SkyBell once they hear your voice. I live on the 3 rd floor, what is the range for this device? I think it would be excellent to save me running up and down those stairs. Can you converse through it? @Christina Yes you can talk through it. At work, yesterday, neighbor boy found our dog in his yard. Rang the bell and I was talking to him from my office across town. For what... a year now? Nice to find a product that does what it says it will. Thank you for your innovation. Thanks for the kind words, Ben! We love to hear positive testimonials! I'm curious about this product. If my husband and I both want to have the app on our phones will that work? Yes indeed, Dawn! Multiple people can be hooked up and receive notifications. Does it cost more to hook up multiple phones? Thank you. No it does not, Roxanne! What type of cell phone is required, iphone? Hi Sarhita, it works with iOS devices and select Android devices which you can find here. @Mike I've got a Motorola Android phone on Lollipop 5.1; will it work with that OS? Hi Marta, if it is not on the list I linked to above, it is not available in that OS quite yet. Stay tuned! @Mike I'm dying to buy this, so hurry up! :-) It's just what we need. I'm interested in all the questions below plus this: How do you know if you have an analog or a digital doorbell? @Fern - A mechanical doorbell has a metal chime that is hit by a striker to make the chime sound. A digital doorbell chime plays an audio file through a speaker. @Mary Beth - Thanks for your comment. There is no way to mount the device without power. My parents have the same situation as you. To make it work for them, we installed an angled wall mount that we sell as an accessory. This gives you an extra 15-20 degrees of field of view. The SkyBell has about a 130 degree field of view so the two of those solutions usually solves the issue. One thing we've realized is that when a visitor hears your voice, they immediately go straight to the SkyBell and look directly into it. They are usually amazed! The field of view is not as much of an issue as it would seem. Is this product compatible with Control4, RadiRA or any other home control system? @Mark - At this time, SkyBell is part of Apple HomeKit and Comcast Xfinity Home. We do have plans to include more integrations. We are not currently compatible with Control4 or RadiRA. We'll be adding support for most open source platforms in the very near future. What is needed for a power supply. We currently have a Nutone. @Wanda - SkyBell works best with two power wires that are connected to a low voltage transformer and a mechanical or digital door chime. That power should be 10-36 VAC 10 VA. SkyBell is not directly compatible with a Nutone system, yet can replace one. The alerts will go from SkyBell directly to your smartphone. I currently have a wireless doorbell. Will your device be able to.work with it? @Richard - SkyBell is not compatible with wireless doorbells. You'd need to replace the doorbell button outside your home and also install a mechanical or digital doorbell chime in the house. These are very inexpensive and easy to install. Can the Sky Bell be mounted on the door's frame, that is where my current door bell's wires come out of the house? @Lucinda - Hi Lucinda, if your door frame is 2.5 inches or wider, it will work just fine with our door frame adapter mount. I have two doorbells, one for front gate the another for my front door. will i have to buy two and manage two? @SUSAN - We'd recommend one for the front door only. There are two reasons: First, you have the correct power setup available, and Second, the range to a gate is often too far for the Wi-Fi to stay connected. @Susan We made a video about the difference between the two and how you can tell. All SkyBells will work with digital or mechanical door chimes. If you have a digital chime, there is an extra step in the installation process. That's it. The Bronze or the Brushed Aluminum finishes are both compatible with Digital and Mechanical Chimes. @Andrew I guess by mechanical you mean analog doorbells - just wondering because there isn't a listing for a mechanical skybell. So does it matter which one I order? or are both versions the same? Hi Cheri, it does matter which one you go with. You just have to check which doorbell you have using the above video! Can the camera's view be adjusted from the viewing device? Also, what are the dimensions of the unit as my doorbell is mounted in a kind of narrow space? Do you have any other security products? @Wayne - Hi There! The camera's viewing angle is fixed and it has about a 130 degree field of view. The device is 2.75" wide and can be mounted on a door frame with a mount accessory. We do not have any other security products at this time. Hello Andrew: I don't have any kind of door bell but really need one. Yours is perfect. How could I install it without having an old one to remove? @Catherine Thank you for the kind words. You'll need to (A) install power to your front door from a low voltage transformer, (B) buy and install and SkyBell and (C) obtain a door chime. SkyBell requires full time power. does it work with a PC? @donna - Hi Donna, SkyBell does not work with a PC at this time, but we hope to add this capability soon! I have a 2 family home with a double doorbell. Would I be able to use this product? @Ann - Hi Ann! SkyBell works best when you have one doorbell for each unit. Icurrently have no doorbell nor can I install one. Can I still use the SkyBell? @Stan - Unfortunately SkyBell requires power to be installed near your door, so it may not work for you. Does it tie in with any other home automation software? @Terry - We are soon to announce integrations with 3rd party home automation software. Unfortunately we can't announce anything at this time. We are also a member of Apple HomeKit and Xfinity Home. Unfortunately, I can't shed too much light on either of those integrations. My current door bell is not working. It was originally ringing to the house phone & we could speak to the person through the house phone. Would SkyBell work for me through the cell phone via wifi without being connected to a doorbell? @John - SkyBell works best when it is connected to a wired door chime and a low-voltage transformer. When it is installed correctly, SkyBell will connect to your home's WiFi network and it will send you the live video to your smartphone. You'll be able to see, hear and speak to the visitor at your door from your smartphone whether you're at home or away. What if you already have a wireless doorbell, how does Skybell work? @Stan - Hi Stan! SkyBell is not compatible with wireless doorbells. You'll need to run power to the front door and also install a door chime. SkyBell uses it's full time power to always be ready to show you who's at your door. We have bats in our rural location. 1) can I turn off the doorbell chime from my smartphone? 2) Do birds/bats typically trip the recorder? 3) Is there an annual fee or free cloud storage until I can get to the recorded clip? 4) Is it easy to review than delete so there is enough space for timely capture of all activities? 1. No, you can't turn off the doorbell chime, but you can make the notifications on your phone silent. 2. No, not typically. It will sense a presence, but won't notify you unless that presence is sustained and bats, pun intended, are quite flighty. 3. No, there is no annual fee. It will hold video like a voicemail. 7. No other accessories, depending on the type of doorbell you have, you'll get the adapter for a digital doorbell, but that's it. 8. Unfortunately, Skybell will not work in that capacity. But another Grommet could. Check out Oco! I live in a city loft that does not have a doorbell. Does that mean this item will not work for me? @sam - That is correct. You'll need a powered doorbell for SkyBell to work. Hi Andrew, I don't currently have a doorbell. Would it be correct to assume that this could be installed by an electrician as though it was a doorbell. Hi S, you'll need a powered doorbell to make it work. This works with an existing doorbell system it is not a substitute. Am I correct that to install this, with no current doorbell, I will need to have a door chime installed and the Skybell in place of what would have been the button? I have landscape lighting (low voltage meter) and standard household electricity available where the bell would be located. Which should be used? How do you tell if you have a digital or analog doorbell?? @Donna Nevermind. I saw the video above as I was scrolling through. Thanks! I really need one of these. This is the perfect answer for my front door situation. How soon can one be purchased and how do I know if my door bell is analog or digital? Thanks! @Christine Just saw the answer to the analog or digital question I had. Now how soon can I buy one? I may buy some for Christmas presents for family members too! Hi Christine, you can buy one right now! Just select whichever doorbell you have right underneath the video. Sounds like a perfect gift for your family to ring in the New Year! The camera's viewing angle is fixed and it has about a 130 degree field of view. The device is 2.75" wide and can be mounted on a door frame with a mount accessory. We do not have any other security products at this time. Hi Arman, if the button is pressed, you will get the notification almost simultaneously. If they don't press the button and just stand there, it will be about 4-5 seconds. 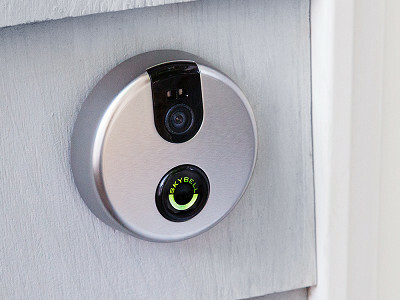 SkyBell is a video doorbell that lets you see, hear, and talk to visitors from anywhere. It works with your Wi-Fi network and the SkyBell app to bring your front door to your phone. When someone rings the bell, SkyBell sends an alert so you can see and chat with your visitor—whether or not you're home. If you have a visitor who doesn’t ring the bell, SkyBell’s motion sensor kicks in and will tell you someone is there. Plus, its infrared camera lets you see them, even if it’s dark.